I provide distinctive, quality photography that documents the uniqueness, love, and beauty of your special day in an artistic way. Your pictures are available on DVD along with reproduction rights. You do not get a second chance at wedding photos so choose a professional that you can trust to make you feel at ease and look your best. Local coverage in Knoxville, TN begins at $1650. Traditional matted albums, modern magazine-style albums, and high-resolution digital files are available to suit each individual client's needs. Packages begin at $325 including prints. As a wedding and portrait photographer, my goal is to create a photographic journal that tells your unique story - the story of your love for each other as well as the laughter, joy, smiles, and excitement in your life. Whether you are marrying your one true love or just sharing a picnic with your children, I strive to capture the natural joy and emotions of the special relationships that make each moment magical and beautiful. I've found that my clients want it all. They want me to capture the expressions and events as they unfold, to document the small details that they've spent so long planning, and also to create beautiful portraits of them and those they love. Using photojournalistic photography techniques allows me to remain as unobtrusive as possible so that you can relax and enjoy yourself with your loved ones while I capture the candid images you want. In addition, I specialize in creative, fashionable portraits that bring out your personality. Whether fun and crazy or romantic and elegant, you will have a unique collection of photos showing the moments, the personalities, and the beauty in your life. I look forward to getting to know each of my clients individually and hope that you will allow me to be a part of your day. To thank you for stopping by, I have decided to share some of my own wedding photos. The photos on this page were taken with a little help from my tripod, timer, and darling husband during a newlywed session at Biltmore Estate in North Carolina. Kathy and I cherish everyday that we selected you as our wedding photographer. To us, you were a very important piece of our wedding and one that we wanted to shine in the end. We selected you because once we looked at your pictures, we were amazed at the subtle but precise way that you captured the moment. There is not a day that goes by that we don’t look at the pictures from our wedding. Our day was so special to us, and it was made even more special when we were able to look back on the moments that we did not even know existed. To see our guests smiling and for you to be able to capture each person at the right time shows your professionalism and dedication to your art. It will always be true what they say, that your wedding flies by, but to have you there to photographer our wedding made time stand still. With each picture that you took, Kathy and I can relive each moment of our most special day and imagine the fun that we were having. Our families have always said that our wedding was like a fairytale and a dream combined, and we have your pictures to prove to us what they meant. There is a saying, "a picture says a thousand words", and the words that we would like to say to you are thank you!! Your ability shows us everyday how much we love each other, and we are forever grateful for that. It's been over a year since our wedding but I can't tell you how many times I have looked at our wedding album and admired our photos. You were able to capture our happiness and joy in each and every picture. Everyone that sees our album comments that they are "the best wedding photos they have ever seen!" I have to agree with them. The first time I saw Nancy's work I knew she had a special gift. All of the emotions and excitement were captured in her pictures in such a creative way. I did not want the traditional wedding photos, and Nancy really helped me set up unique shots. She really took the time to prepare and get to know us before the day arrived. I felt at ease and had full confidence that the pictures would be amazing. When we arrived back from our honeymoon I could not wait to see them. Every time I look at our amazing photo album, it takes me back to that perfect day. Thank you so much. I would not change a thing. We were on a very tight time schedule and budget for our wedding. For those reasons we had to pick a photographer solely based on cost and availibility not their work. Once we received our wedding proofs back I was very disappointed in them. I had certain things in mind of how I wanted them to look and certain shots that I thought she took. They weren't terrible pictures but definitely weren't all that I envisioned. I started thinking about getting some retakes done. Then I met Nancy. I was very impressed with her attitude and her responses to my questions and then I saw her some of her work. Amazing. She shoots digital which our wedding photographer did not and there is a huge difference in quality alone. Throughout the time of our reshoot she was fun and easy going and really made efforts to take the shots that we wanted. She is very good at noticing the little details that really take a picture from good to great. Our retake pictures are amazing and my husband and I are thoroughly glad we decided to do them. I wanted to thank you for the wonderful job you did photographing our wedding this past May. Words can't describe how appreciative Justin and I are to you and your husband for traveling all the way down to Montgomery, Alabama. We also appreciate your willingness and the easiness of working with you from 6 hours away. I have had nothing but great comments on our pictures and have even shouted your praises to newly engaged brides in hopes they will use you too. You really captured every emotion everyone had that day and evening. Each picture was beautiful and unique and I haven't been able to pick just one to print and frame. I cannot wait to see my wedding album you help design. Thank you for everything you have done for us. My family loves you guys and hopes you will continue to photograph each child's wedding in the future. They can't say enough about my pictures as well as my cousin Britney's. They all turned out great!! We all would highly recommend you to any bride searching for a wedding photographer. Thank you again for making our day so special and memorable!! I am so proud of seeing your work blossom into one of the best wedding photographers in the Southeast. Keep up the good work and I am sure I will be speaking with you soon!! Of all the people we needed to work with us on our wedding day, Jeremy and I easily agreed that the photographer was the most important person. When we grow old and gray and our memories fade, we will rely on the pictures from our wedding day to bring back those once-in-a-lifetime moments. 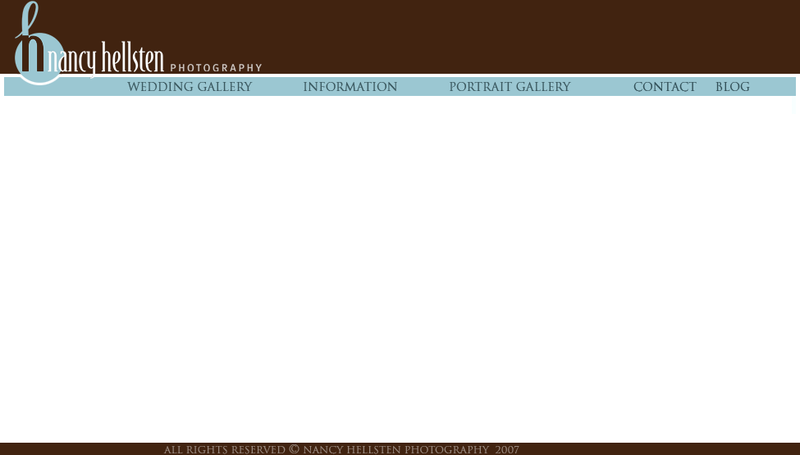 After seeing the photography of Nancy Hellsten, she was an obvious choice. Her mix of color and black and white has a unique way of beautifully portraying the events you never want to forget. We loved the way Nancy captured the most special parts of our wedding. Her photography tells the complete story, allowing us to relive each and every sentiment of that day. We were able to view Nancy's pictures of our wedding so quickly and have not been able to stop looking through them since. We have had so many of our family and friends praise our wedding pictures, saying they are some of the best they've ever seen. Jeremy and I just shrug and say.... "we had an amazing photographer!" We couldn't have been happier with Nancy's work! I honestly can't say enough about the beautiful work that you did for our wedding. On a day that flies by in what seems like two minutes, the photographs that you took help us stop time. I can remember the conversation my husband and I were having while sitting on a swing. I can see the pride in our parents faces as their babies take the next step in their life. The pictures heightened my wedding experience because I can enjoy those moments and memories anytime I want. I can't stop looking at them, I love them so much! Nancy, you are a true professional. Weddings are notorious for being stressful events (at least I felt like mine was), but you gently guided me and Bart to document our day without dictating it. I would recommend any couple who wants great photos to hire you. Without a doubt, it was the best decision we made in our wedding planning. Nancy Hellsten was an absolute joy to work with. She was professional and friendly, and took some amazing candid shots of myself, my husband and our family. Her artistic skills far surpass anyone else's that I have seen in my search for a wedding photographer, and she posted our gallery and mailed our DVD promptly. I'm so pleased with my pictures, they're gorgeous! my goodness....i am speechless!!! the pictures are breathtaking, and i had to second glance them to make sure that was me!!! you did such a beautiful job, and i couldn't be more pleased! i love how you captured the moment with such elegance. i am so thankful we had the chance to work with you, and i imagine that you will be getting quite a few referrals. i sent the link out to my teachers, and they too were in awe. several asked for your name...thanks again!!!! There are many photographers out there, but it takes more than just a camera to capture the most important day in a couple's life. Nancy Hellsten has a gift. She is able to recreate the wedding day through her pictures- to show the emotion of the moments; the excitement, the laughter, and the love. Nancy is more than just a photographer, she is also a friend. She goes out of her way to make the wedding flow as smoothly as possible and then keeps working after the wedding to make each photograph beautiful. The hardest thing about working with Nancy is choosing a favorite picture, because each one is a work of art. After all the wedding planning is over, the cake has been cut, and the flowers have wilted, the memories are what will remain. Nancy captures these memories in a way that will be cherished forever. She is wonderful at what she does and will be an amazing asset to any wedding. Hiring her was one of the best planning decisions we made. Nancy, thank you for sharing your gift with us and giving us beautiful pictures we will always treasure. My wedding truly would not have been the same if it were not for Nancy being there with her amazing talents. She was truly able to capture not only the events of our wedding but she was even able to capture the mood and the feelings of the day. I cannot thank Nancy enough for the wonderful pictures that she took at my wedding. They will truly last a lifetime. I feel very blessed to have found her and to have had her participate in my special day. Just a piece to let people know who truly impressed my family and I are with Nancy... she will be the photographer for my brother's upcoming wedding!!! My husband and I have been married for nine months now and time has absolutely flown by. It being our first Valentine's Day as a married couple we reflect back on our most romanctic day, our wedding day. Going through our wedding photos several months later, we are still amazed at their beauty. Thank you from the bottom of our hearts for capturing what has been thus far the most amazing and romantic day of our lives. Our friends and families still talk about how our wedding photos are "absolutely the most beautiful" they have ever seen. I would also like to add that many of our wedding guests complimented your proffessionalism during the wedding day. You seemed to be everywhere but never got in the way. We were so lucky to have found you. I wish we could do it all over again but since I only plan to marry once, we can relive our day through our photographs. After viewing some of your galleries online, I felt fairly confident that you would be able to meet the expectations of myself and my husband for what we wanted on our wedding day. However, when I first saw the pictures from the wedding, I was speechless. They were more amazing than I could have imagined. You made us feel so comfortable and really took the time to capture all the details of our wedding. Each time I look at those pictures, I feel like I am reliving the day all over again. You really chronicled the whole day and did it beautifully. I have referred you to almost everyone I know. There really is no other photographer like you in the area. Thank you so much for being a part of our wedding. I always wanted a traditional, but fun church wedding. Because of it being my home church for 15 years, Church Street United Methodist Church was an obvious location for Kevin & me to tie the knot. Although there was a main concern for us, the restrictions the church had on photography. I didn’t want a photographer crawling over guests just to get a good shot, and I didn’t want a photographer who was going to inconvenience everyone on our special day for a picture! Once I met with Nancy I was hooked. I knew she was a perfect choice! Once I arrived at the church on the wedding day, everyone was so happy and Nancy was already taking the pictures she could for us to remember even the small details of our big day!!! When my mom was tying me into my dress I didn’t even realize Nancy was in the room! She got the family pictures I wanted for keepsake, but also took photos that would capture the personality of everyone. Even when I was nervous she calmed me down with some brief photos that turned out to be my favorites. After returning from the honeymoon, Kevin and I watched our wedding slideshow for the first time. Tears began forming in my eyes and Kevin just smiled. I remember thinking she captured everything perfectly!! The laughter, the joy, the love, the fun was all captured because of Nancy. Now, when I look back at my photographs or watch my slideshow I find myself get a smile on my face, still have some butterflies in my stomach, and I remember everything about that day. So many people told me to take it slow, it goes by so fast; look everywhere and at everything because you will forget; don’t stress because it is not worth it. Nancy was fabulous in capturing exactly what was important to us, and because of her extraordinary artistic eye nothing will ever be forgotten about our wedding day! Thank you Nancy for giving us memories that will last throughout out lives!!! You were such an important part of our day, and we didn’t even know you were there! My family loved her so much she is even photographing my sister’s beach wedding in October!!! Special thanks to the Trio for allowing me to use their beautiful music on this site. I am a proud member of The American Child Photographers Charity Guild. We offer free services to desperately ill children. Contact me for more information. I also volunteer with Now I Lay Me Down to Sleep, offering free photography services to parents who are experiencing the loss of a baby. To check availability, receive pricing, or set up a personal meeting, please submit this contact form. For wedding inquiries, please provide the details that you can. You can also call 865-360-4567.